Women, LGBT, the disabled. They're Silicon Valley, too. He's gay, never went to college, and works as a product designer at Facebook. She's 50 and is an engineer at Instacart. He was once homeless on the streets in Richmond, Virginia, and now runs his own startup. 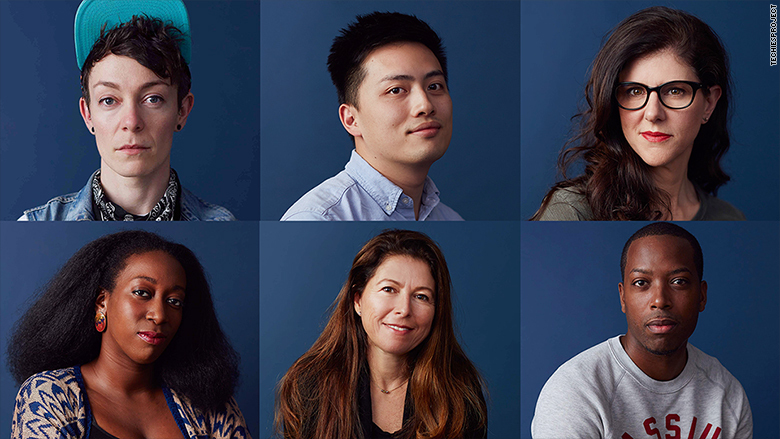 These are just a few of the faces that make up Silicon Valley, and they're part of a stunning oral history project, dubbed Techies, that launched on Monday. Photographer Helena Price, 28, spent the past three months working on the project. Her intention was to challenge the stereotypes about the people working in tech. "This is a very interesting time. Tensions are high, diversity is so topical right now," she said, adding that the inspiration for the project stemmed from her own experience. She moved to San Francisco in 2009 from a small town in North Carolina. "I didn't have any money, didn't go to a prestigious school." In January 2016, Price put out a call-to-action for the portrait-based project, looking for for underrepresented subjects in the "greater tech narrative." Silicon Valley engineer: "We're in a precarious place with race relations"
"I want to hear from women, people of color, folks over 50, LGBT, working parents, disabled, etc.," she wrote. People responded in droves. Price said she received more than 500 responses in two weeks. She then had to narrow down the pool to just 100, a process she said was "really difficult." "I was reading through [responses] over and over again," she said. "There were many, many people who had amazing stories but didn't make it into the project." She said she didn't want the outcome to skew too positive, or too negative, when it came to subjects' personal experiences. "I wanted to explore the complexities," said Price, who was previously a "techie" herself, working at startups like Skillshare. Price spent February speaking to all 100 people -- some in person, others over Google Hangouts. Listening to so many life experiences in such a short amount of time was "one of the most intense months of my life." She transcribed and published each interview on the site, along with the photos, which she took throughout the month of March. Her project features some vocal diversity advocates, like Walker & Co. founder Tristan Walker, Pinterest engineer Tracy Chou, and Slack engineer Erica Baker. Price hopes that the project has a ripple effect in Silicon Valley and beyond. "I'm hoping it takes on a life of its own," she said. "I want these people to meet each other, I want people to get recruited. I'm excited to see what it does to everybody's life."